Any Questions on the AHA CPR Instructor Course please call our office at 973-694-2893. Course Info: Thank you for your interest in becoming an American Heart Association BLS Instructor. The American Heart Association CPR Instructor Course will allow the participant to teach all American Heart Association BLS level certification & Heartsaver CPR classes. Step 1: Attend the instructor screening course, the candidate will be tested on your CPR knowledge. In order to reserve your seat, you must pay a $55 testing fee. You will be issued a version of the BLS Provider written test and you will demonstrate your skills in 1 and 2 rescuer adult, child and infant CPR, use of an AED and use of airway devices including a pocket mask and a bag valve mask. As an instructor candidate, you will need to pass the skills test unassisted and pass the written test with a minimum score of 92% or better. Once the testing process is completed, assuming you pass the testing, Full Payment is due at the end of Step 1. If you do not pass the screening or written exam with a 92% or better, the instructor course ends for you and you forfeit the $55 testing fee (paid in advance). Step 2: If you pass your screening exam we will spend the remaining time going over your roll as an instructor. This time will be spent reviewing all of the AHA materials, such as the instructor manual and course DVDs, reviewing course paperwork, setting up classrooms and learning how to properly test students. This portion will take approximately 3 hours. Step 3: Take the BLS Instructor Essentials Online Course, this is an additional $30 dollars (paid by the student instructor, not included in the $225). This course can be taken at https://onlineaha.org/courses/97 The BLS Instructor Essentials Course is designed to prepare instructor candidates to teach AHA Instructor-led and blended learning courses. Step 4: This is the final step in the process, and sometimes the most difficult. In order for the Training Center to issue your instructor card, each candidate needs to lead a BLS Provider Course and be successfully monitored by the Training Center Faculty (TCF). This is where the process varies between candidates. Some candidates have a teaching background and only need to learn the material. For the candidates who have teaching experience, the process may be completed in two class. Some candidates may have never presented in front of a group before and have to overcome the fear of being in the front of the room before they can start to teach the topics and this may take several classes to complete. This last step is completely up to each candidate's time frame and the Training Center is committed to helping you all the way through this process. Prerequisite: All participants must posses a valid American Heart Association BLS Provider certification card. Manuals: Instructors must purchase the BLS or Heartsaver Instructor Manual for the discipline they are teaching. 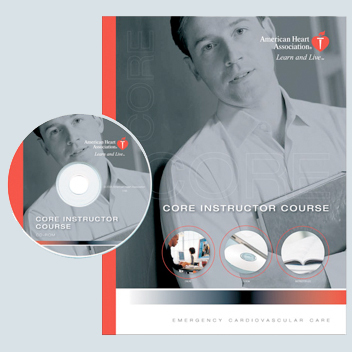 BLS Instructor Manual $36.25 / Heartsaver Instructor Manual $54.00 These are additional costs to the instructor to properly teach the course. This is an American Heart Association Instructor Course, do you have a current (not expired) American Heart Association BLS Healthcare Provider Card?